The Abacus range of accessible baths with powered features such as height adjustment, bather transfer seats and integrated changing platforms deliver utmost care, comfort and safety to semi-ambulant users. They ensure carers can assist at safe working heights with the reduced risk of back and muscle injury. Stand H50 will display two popular baths from the Abacus range – the hi-lo platform Gemini and compact Scorpio with bather transfer seat. In addition to product demonstrations and one-to-one consultations, stand H50 will offer free educational material including case studies and DFG bath funding guides. This literature is part of the ongoing #BathingIsBetter social media campaign by Abacus which highlights the advantages of accessible bathing over adapted showering. 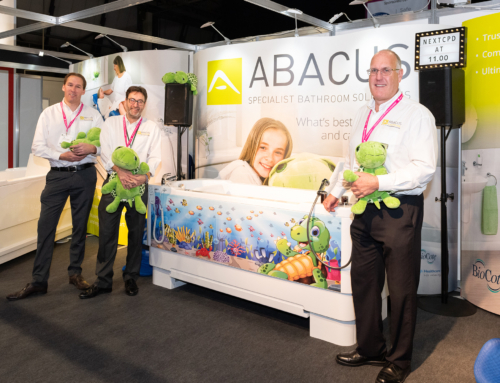 Healthcare professionals visiting the OT Show will be able to experience first-hand why Abacus baths deliver better care, safety and bather enjoyment. The height adjustable Gemini from Abacus is a leading paediatric choice for OTs with its integrated changing, drying and bathing platform. This in-built surface reduces the number of bather transfers, increases safety and ensures the bathing experience is positive. The Scorpio encompasses a powered transfer seat so bathers can benefit from fully supported access in and out of the bath. 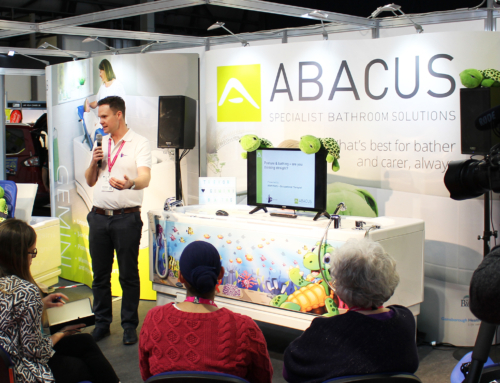 To enhance the educational content available on the stand, Abacus representatives will be on hand to explain their free ‘Lunch and Learn’ seminars that are available to all moving and handling specialists, OTs and physiotherapists. These nationwide educational sessions are held at any location across the UK and provide the latest guidance and information regarding safe assisted bathing. For fun, there will be the opportunity to win the Abacus Mascot ‘Trevor the Turtle’ cuddly toy at the OT Show. Professionals will be able to enter a free prize draw with a view of winning Trevor for one of their young clients. Trevor will be especially dressed as a Superhero this year to coincide with the theme of the 2017 event.